I have only recently started blogging. It is not my natural way to spend a Sunday afternoon, but I have to do something to get me out of the washing up. As of yet, I don’t know if I am any good at it. I worry about my grammar (and I apologise to any pedants who read this; just be gentle). I have had feedback and I have been told that my blogs to date have been interesting (often a word I worry about) and I have just had someone tell me that I brought the food to life; I can’t ask for more than that. When Russell started his website and asked me to do a guest blog, I was delighted. I have respected Russell for a long time and I am lucky to be able to call him and Eléna friends. Russell is a perfectionist in everything he does. Anyone who has eaten over the years at Sienna knows this. He puts his heart and passion for food on the plates that he send out of his tiny kitchen, for us as customers to enjoy. Every plate is special – the colours, combinations, flavours and tastes always excite and never fail to impress. You go with a smile on your face and leave with a big, replete grin. I have to say, I am writing this with a tinge of sadness. Sienna is a food chapter that Russell and Eléna are bringing to an end. What I tell myself is that it is only the end of a chapter, a delicious chapter, but not the end of the novel. Things have to change, some for the good to breathe new life into what you do…..even when it is done so well; you do not have a Michelin Star for 5 consistent years without doing something very right. For those Interested, I did just do the washing up! I think I had better do a bit about myself. I am an accountant – please do not stop reading…….. I am an accountant and it is my day job (which I enjoy and gives me the opportunity to do many other things in life). After Jane (my lovely wife) and my family, food is my passion (okay, there is Burnley Football Club as well). I should start by saying, I am an amateur, enthusiastic foodie (I need to find a new word, than ‘foodie’). But, I am privileged and very lucky! I get to live a food life that many dream about. I eat out at great restaurants……… I know great chefs, many I call friends…….. I get to judge – Taste of the West, Guild of Fine Food, Bristol and Bath Good Food Awards, Western Daily Press and Padstow’s Sticky Toffee Pudding Competition….. 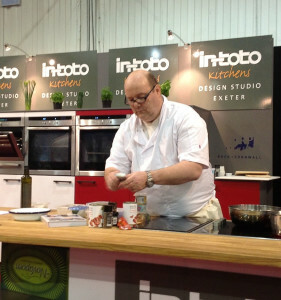 I occasionally blog…… I have the opportunity to do food demos on stage…… I organise pop up restaurants for charity and will soon have the Great Bristol Menu and 40 Alfred Place Pop Up. With the latter I will bring together my Lancashire roots with my adopted South West larder. My passion for food was summed up in 2013 when I won South West Chef of the Year (amateur). I was and still am very proud. At my heart I am a home cook. My aim in life is to create good food at home and use fantastic local ingredients. If by doing this I am able to promote the amazing food businesses, growers, manufacturers, farmers then that is an added bonus. In the South West and further afield we have so many great people who put their soul into what they do and I am fortunate to have met many of them. As an introduction, I hope that gives you an insight into me. A larger than life foodie. Enthusiastic and passionate about ‘farm to fork’ and ‘pasture to plate’. I hope to bring to life what I write about and get you interested in visiting restaurants – new and old – trying new products and exciting your taste buds. Follow me here, with my blogs and on Twitter . Here’s one of my recipes! 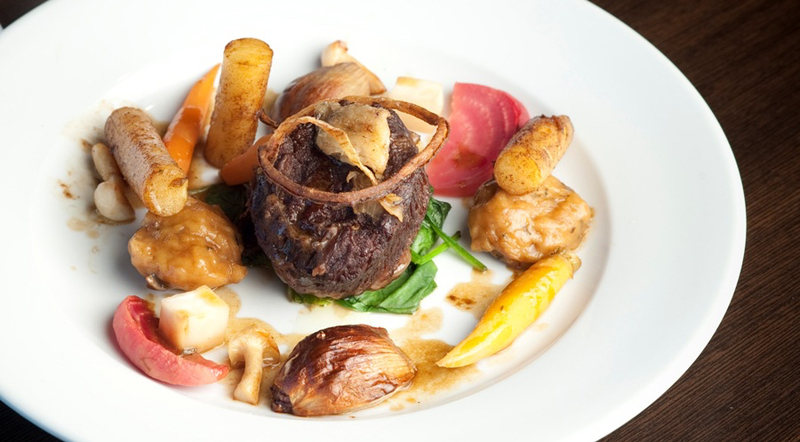 Ox cheek cobbler cooked in artisan beer stock and bone marrow, served with crispy onions, fondant potato, spinach, baby pickled vegetables. The recipe is based on sourcing as many ingredients as possible from across the South West. Vegetables from Total Produce, Bristol. Pre heat the oven to around 180°C. Make your own beef or veal stock or buy a good one. Reduce down by half the artisan beer and add the stock and some thyme. Heat through and leave, you should still have around 1 litre of beef ale stock (remove the thyme before use). Mix together the flour and butter by hand or in a mixer. Add some thyme leaves. Once combined, add the milk (pour in slowly as you may not need all of it) until it all comes together. Remove and kneed gently and then set aside in the fridge (ideally leave for a few hours). Depending on the size of the ox cheeks, maybe cut them in half and trim any excess fat/sinew. In a frying pan brown them to add colour and season with salt and pepper. Put the cheeks on one side and then brown the onions (leave whole if possible), add the garlic and mushrooms. Using a pressure cooker, add the ox cheeks, onions, mushrooms and hot stock. Add a few splashes of Dorsetshire sauce and a squeeze of vanilla paste (this builds on the depth of flavours). Put in two small pieces of bone marrow, to give that unctuous quality to the dish. Based on your pressure cooker’s instructions cook for 45 mins. (This could all be done in the oven for a few hours on around 150°C). Prepare your vegetables. Cut into 3mm cubes (brunoise) or small florets. In a pan, heat the cider vinegar and sugar and then add the vegetables. If small enough you shouldn’t need to blanch. Leave them to cook through, tender with a bite. Peel the potatoes and cut into circles about 4cm deep. Shape the top and bottom to give an edge with a paring knife. Melt butter in a pan, then add the potatoes. Colour on both sides. Add the stock and leave to cook through. They are cooked when you easily insert the tip of a knife. At around 20 mins, take the pressure cooker off the heat and release the pressure. Take your cobbler mixture and roll out thinly, cut out 4 small rectangles and put these in the oven to cook through until nicely brown. With the remaining mixture, roll it into small balls (about 8) and add to the pressure cooker. Put the cooker back on and cook for the remaining 20 mins. Lightly cook the spinach or cabbage leaf. Dry thoroughly once cooked and keep hot. Slice the shallots into rings, dust with flour and deep fry until crispy, then season with salt. On a warm plate, place the ox cheeks, dumpling, an onion and mushroom. (Remove some of the stock, start to reduce to a thick sauce and add some butter to finish). Put a small circle of spinach and sit the fondant potato on top. Spread some of the pickled vegetables around the plate. If you want add a small piece of bone marrow to the plate, or remove the marrow and dot around the plate. Spoon the reduced sauce around the dish. Take the cobbler from the oven and sit on top of the ox cheek to add texture and sprinkle the small fried onions around the dish. Welcome to blogging, Steve. Recipe looks great. And so sorry to lose Burnley FC from the Premier League!